With a winning recipe of humor, humanity and heart, CINEMA SIX is a rare commodity: a film with classic comic timing executed by new voices in adult comedic cinema. The chemistry of the leads... jumps off the screen as much as the outlandish, expletive-filled dialog that brings to mind films such as Superbad and Animal House. It's quick, fun filmmaking at its finest... Cinema Six also reaches Departed levels of vulgarity and profanity, complete with defecation. In other words: it's pretty close to perfect. 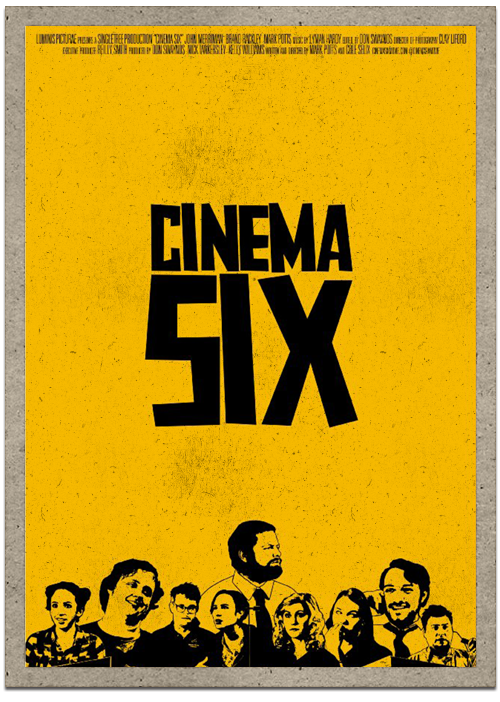 I cannot recall a recent comedy that is as emotionally complex as Cinema Six. This is a little love letter to movie theatres. If Slackers and Clerks met, made love, and had a baby, they would christened that lovechild Cinema Six. Cinema Six is now available across American Cable in Movies on Demand! Mason, Dennis, and Gabe have worked at the Stanton Family Cinemas for longer than they want to remember, but long enough they don’t want to leave. Most of their time is spent messing with customers, watching fellow employees work out their relationship issues and basically just slacking off, but at a cost. Mason has a wife and child at home that he neglects too much, Gabe is considering college, but is scared of failure, and Dennis just dropped out of college after his fiancé cheated on him. The three are working things out together at their second home, the theatre, until Mason’s wife reveals she’s pregnant for the second time and his volatile home life comes to a head. Should Mason swallow his pride and beg his father-in-law for a job? Can Gabe get past his pessimism and fear and leave the projection booth? And can Dennis finally start to deal with his issues? Maybe. But first, they have some customers to ignore.